Much has been written about the intelligence of crows, the supposed smartest of bird species. American Crows must have keen eyesight because they detect my slightest movement (like raising the camera lens toward the window) and quickly fly off. Large brain size and a well-developed cortical area responsible for learned behavior may be what gives them their smarts. They make and use tools to retrieve food items, organize mobs to drive away predators (a “murder” of crows), use bait to attract prey, watch and learn new behaviors from other birds or their own family members, communicate spatial and temporal information (about food items) to other family members, and can recognize the facial features of different humans. 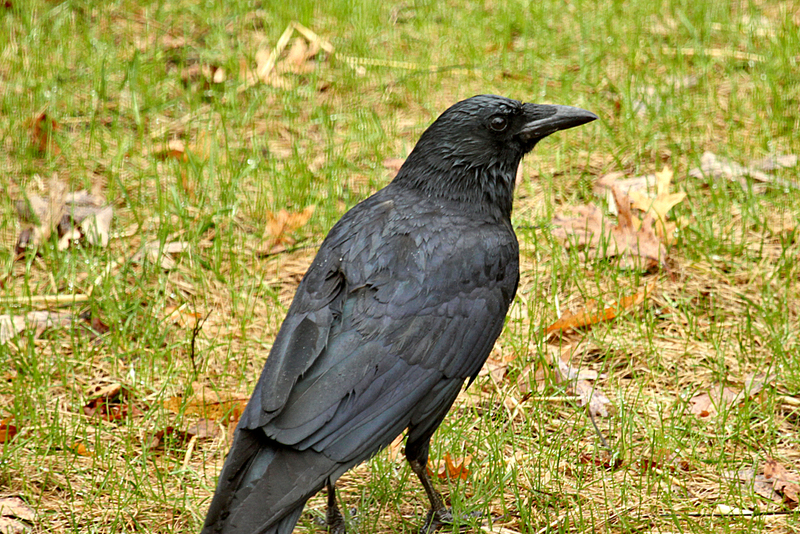 Some researchers claim that crows have intelligence on a par with that of chimpanzees. This entry was posted in Birds, Gardens, Nature, Wildlife and tagged crows. Bookmark the permalink. Hi Tim! thanks for reblogging my post. I see you have a mighty fine blog here and look forward to learning more about it. Thanks Sue, you’ve got a great blog too which I’m enjoying reading!